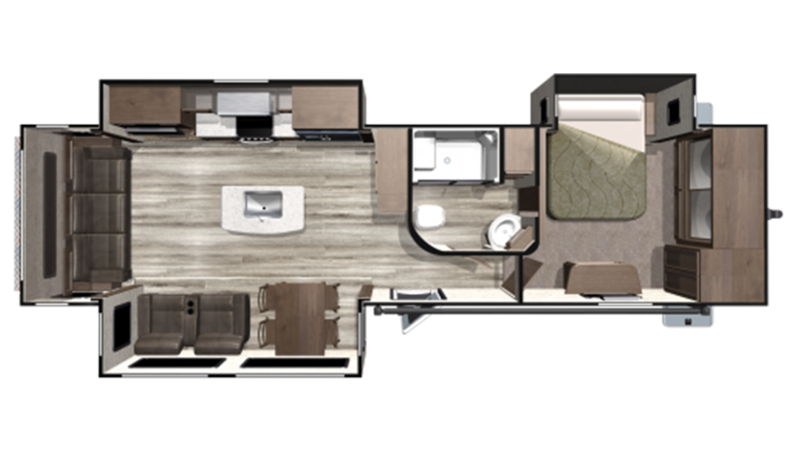 Travel anywhere in stylish comfort with the 2019 Highland Ridge Mesa Ridge MR323RLS Travel Trailer! National RV Detroit is a top, full service RV dealership in Belleville, Michigan. Our dedication to providing top-notch sales and service to our customers has made us a success in this state and beyond, ever since we opened our doors in 2008. We offer all the top brand RVs at wholesale prices with great financing that can fit any budget! So stop in today and let us put you in the RV of your dreams! We're conveniently located at 44700 N I 94 Service Dr Belleville Michigan 48111 and we're ready to make your RV dream come true! Even if you don't live near Belleville or the Detroit area, we can still help you thanks to our personalized phone and internet service, and our 24/7 delivery service that covers all of North America! With a hitch weight of 1081 lbs. and a GVWR of 11435 lbs, the Highland Ridge Mesa Ridge MR323RLS is easy to tow and go! The 15' 0" patio awning provides shade and UV protection during outdoor living! Cozy into the Queen bed for a restful night of comfort and sweet dreams! There's enough comfortable bedding in this RV to sleep up to 4 people! You know food always tastes better when you're on vacation! Fun and fresh air just make meals more satisfying, and you'll cook up great dishes for your family in the handsome kitchen! It comes with a convenient 3 burner cooktop where you'll make steaks, burgers, fish, eggs, pancakes, grilled cheese sandwiches, and lots more great food! Stock your favorite meats, veggies, and drinks in the handy 8.00 cu. ft. refrigerator! You'll be able to clean, drink, and cook with plenty of water from the 50 gallon freshwater tank!